Burger, Fries and Pie... View the online version of this message. 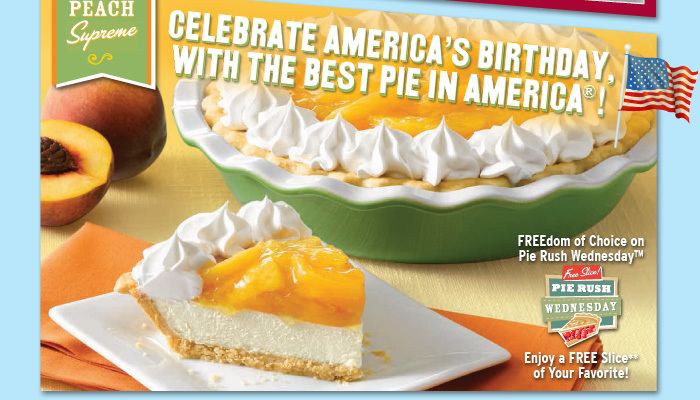 *Burger, Fries & Pie All-American Meal Deal includes a slice of Fruitabulous pie only. No coupon necessary. Not valid on Pie Rush Wednesday™. Not valid with any other offers, promotions or discounts. Tax and gratuity not included. **Pie Rush Wednesday™ details: Free slice of pie with any menu item purchase from 10:30am until close on Wednesday. No coupon required. Beverages, side items and pie slices do not qualify as a Pie Rush Wednesday menu item. Dine-in only. Limited time only. May not apply to all varieties. Excludes Pie Shop Special. One slice per person per purchase per visit. Valid only at participating restaurants. Not valid with other offers, promotions, discounts or coupons. Tax and gratuity not included. Promotion subject to change. This email was sent because you joined The Bakers Square eClub in one of our restaurants, online or at one of our events. Your email address will not be shared, sold or rented with anyone. ©2013, American Blue Ribbon Holdings, LLC.